Unpredictability has been the constant in Joey Barton's life. Few other British footballers have been analysed so widely as the 33-year-old, including Barton's own extensive self-reflections, yet still he remains impossible to pin down. From the moment he was linked with a move to Rangers, previous comments - mostly on Twitter, where he is a regular and intriguing voice - about supporting Celtic, about the quality of Scottish football, even about the monarchy have all been recirculated. That effort misses the essential point, of course, that Barton's commitment is to living and working on his own terms. He has eschewed the archetypal life of the top-flight footballer and, eventually, his childhood background. He has often spoken of his upbringing in Huyton, a hard and impoverished area of Liverpool, and the common currency of violence and aggression. The arc of his life in the public eye has moved from a thuggish reputation to a studious, philosophical air. He has spent time in jail but also at university, and once described Joey as a "stage name", an adopted persona that he has used on football pitch since it was once written down on a team-sheet even though friends and family call him Joe. The midfielder once used anger to fuel his professional life, railing against fans, sports writers, managers. There were, as a consequence, flashpoints that for a long time defined him; stubbing a cigar out in the eye of a youth teammate at Manchester City, a training ground fight with Ousmane Dabo, off-field altercations. "I had far better financial offers but I swore to myself a long time ago I would never make a career decision based on finance. You've got to be true to yourself as a human being. You've got to be comfortable looking the man in the mirror each morning in the eye. Coming to Rangers allows me to do that and know I'm taking on the correct challenge." Barton has reinvented himself; in a shorthand way, he has gone from CCTV footage of fighting to being a guest on Question Time. So nobody ought to be surprised that on the verge of a return to the English Premier League, and all its riches and glamour, Barton has chosen to sign for Rangers. The offer of a two-year contract, as opposed to the shorter deal proposed by Burnley, would have helped, but Barton was genuine when he spoke of having already sampled life in the Premier League - particularly the slog of a relegation battle - and of seeking new experiences. His past is a clutter of events: outbursts, aggression, analysis, but also a playing career based on tireless energy and enough technical ability for Barton to have been capable of playing at the highest domestic level with Manchester City and Newcastle, and impressing in Ligue 1 with Marseille. Barton's previous comments, and his prior indiscretions, are not relevant to his arrival at Ibrox. His performances for Rangers will carry far greater weight, and on the evidence of last season Barton remains a player capable of influence. He made 40 appearances for a Burnley side that delivered enough consistency to rise to the top of the Championship. Barton scored three goals, received 10 yellow cards and played his way into the division's team of the season. Rangers' head of recruitment, Frank McParland, held a similar role at Burnley last summer, and is also a fellow Liverpudlian. Mark Warburton is a close friend of Burnley boss Sean Dyche and the Rangers management team are convinced that they are signing a player with the experience and application to bring steeliness and leadership to the side. "Being Joseph Anthony and having gone to Catholic schools, I didn't really have a choice when it came to it. So I looked out for one of the teams when the Old Firm was on. I've said on Twitter, amongst other things, I'm a Celtic fan. You have to take that in jest. I don't think anybody will have any doubt about my allegiances when we play Celtic." Barton and Dyche formed an effective working relationship, although the player has not always responded so positively to managers. The dynamic between the midfielder and Warburton will be critical, but Barton has in effect chosen to perform in a particular environment rather than with a particular individual. At Rangers, he will hope to compete for trophies, and be asked to be a figure of authority and know-how to help develop younger players, in particular fellow Scouser Jordan Rossiter, who has joined from Liverpool. With his three million Twitter followers, well defined sense of his own identity, and colourful back story, Barton brings a slew of attention with him. He might find Glasgow constricting, since Old Firm players tend to find that life in the city can be intense and intrusive, but Rangers believe they have signed a good player but also a man whose family life has grounded him - he and his long-term partner have a young son, Cassius, who joined Barton at his first Rangers press conference. 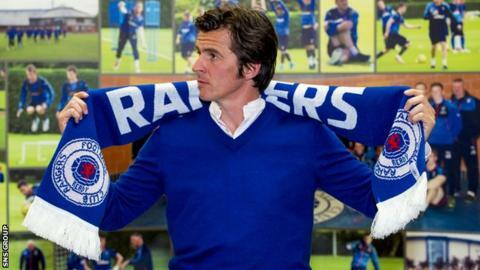 To thrive at Ibrox, Barton will have to deliver on the field and avoid pitfalls off it. On recent evidence, he has found the means to apply that balance to his life.